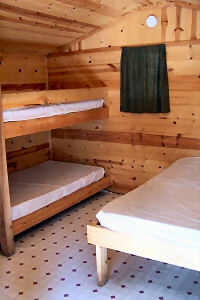 We have 11 cabins that include one full size bed and one set of bunk beds. 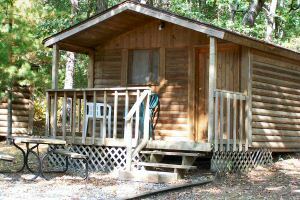 In addition, we have available, one handicap cabin that has one full size bed & one twin bed. All cabins are furnished with electricity. These are very popular during the off-peak hunting seasons. You will have to provide all your own linens. Outside of the cabin you will find the patio and gravel area equipped with a fire ring and picnic table. The Camping Kitchen, located across the street, provides a sink, some counter space, picnic tables and a grill. If you are interested in renting the cabins during any of the Wisconsin hunting seasons, please call our front desk to check availability. Our resort provides a wide variety of amenities including a heated pool, play grounds, volleyball court, game room, horseshoe pits, shuffleboard area, and paddle boat and canoe rentals. We also offer a camper's lounge with a fireplace, TV and DVD player. See our Amenities Page for a f ull list of recreational activities and details. Ho-Chunk RV is a Pet Friendly Campground. If you are bringing along any furry friends, we ask that you review and follow our Campground Policies. If you have any questions on our campground sites, campground rules or the services we offer please read our information pages or feel free to contact our friendly staff.